Enter the world of Star Wars and launch into action and adventure! Discover a galaxy of starships and vehicles, and get immersed in exciting stories of good versus evil against a backdrop of a universe populated by heroes, villains, droids, and space creatures with the Star Wars Bladebuilders Kylo Ren Deluxe Electronic Lightsaber! Imagine slashing into a fiery battle as Kylo Ren with the Kylo Ren Deluxe Electronic Lightsaber, featuring a pulsating light effect and authentic lightsaber power-up and battle sounds. Activate light effects and watch the lightsaber flicker and pulsate like Kylo Ren’s unique fiery lightsaber. 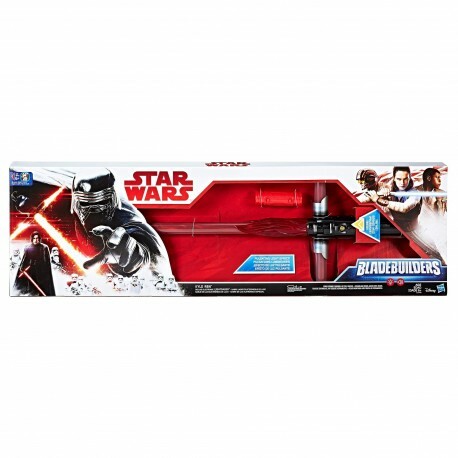 The Kylo Ren Deluxe Electronic Lightsaber also comes included with a connector that allows for a customizable Bladebuilders lightsaber experience! Additional products sold separately. Subject to availability. • x2 1.5V AA. ALKALINE BATTERIES REQUIRED. DEMO BATTERIES INCLUDED. SEE INSTRUCTIONS.